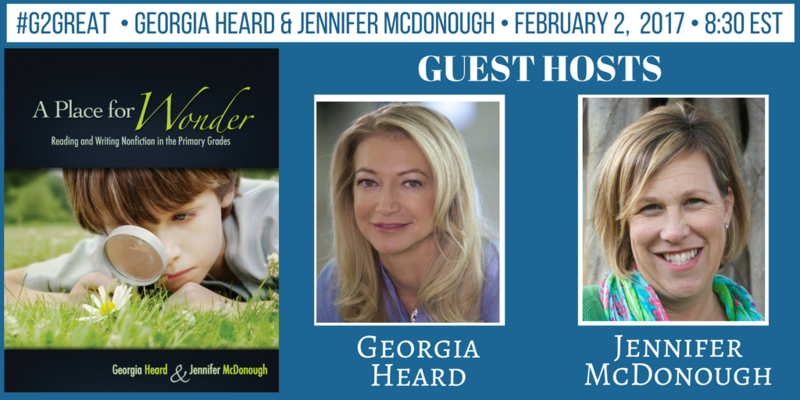 On February 9, 2017 #G2Great was honored to have two very special guest hosts, Eden and Ella. Like Adele, Bono, Fergie, Jewel, Lorde, Pink, Rhianna and Shakira these rock stars who were our special guest hosts only need one name – Eden and Ella. 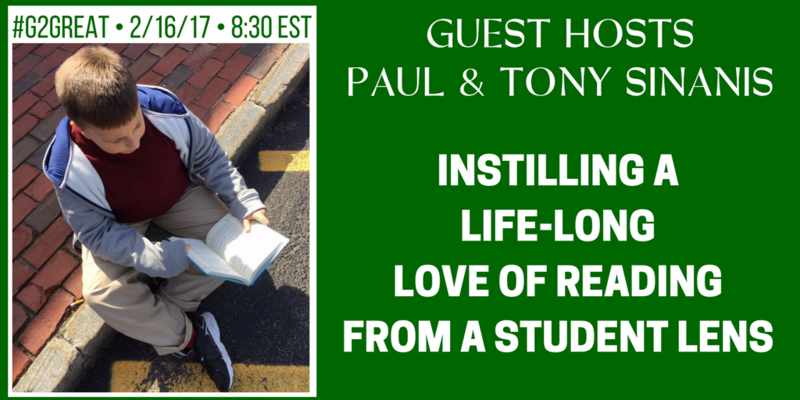 These two guest hosts symbolize all that #G2Great stands for; keeping our students at the center. Eden and Ella are the rockstars of education, they represent the students we all are here to serve. 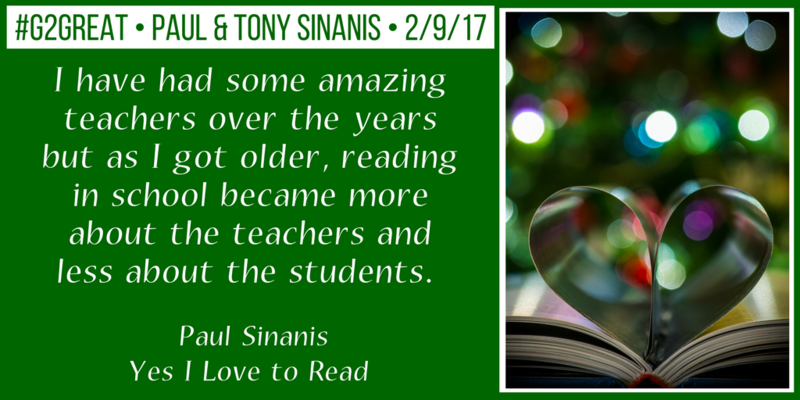 These rocks stars are the reason we are educators and the reason we continue to spread our message; the vision that led us to create our blog Literacy Lenses. This dedicated group on our mountaintop includes students, we invite them to stand beside us, learn beside and become a collective force in the learning landscape of education. 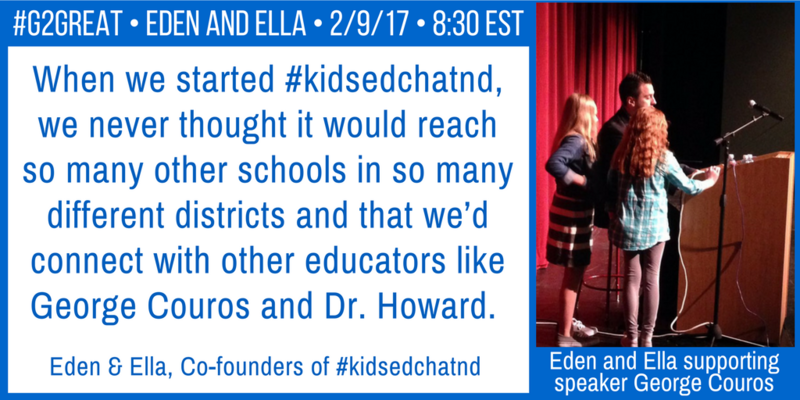 Eden and Ella created #kidsedchatnd when they were in fourth grade, they found an innovative way to create a space for kids where they could share and grow ideas together. That collaborative thinking is what we often refer to at #G2Great as thinking in the company of others. It is just what students and adults need to do to engage in the level of thinking and learning we need to be successful, responsible, well-informed and critical thinking citizens in a global community. In spaces like this amazing ideas are born. These are the places where thinkers, often with different perspectives can come together, share ideas, develop new ideas and nurture those ideas as they grow into something amazing. 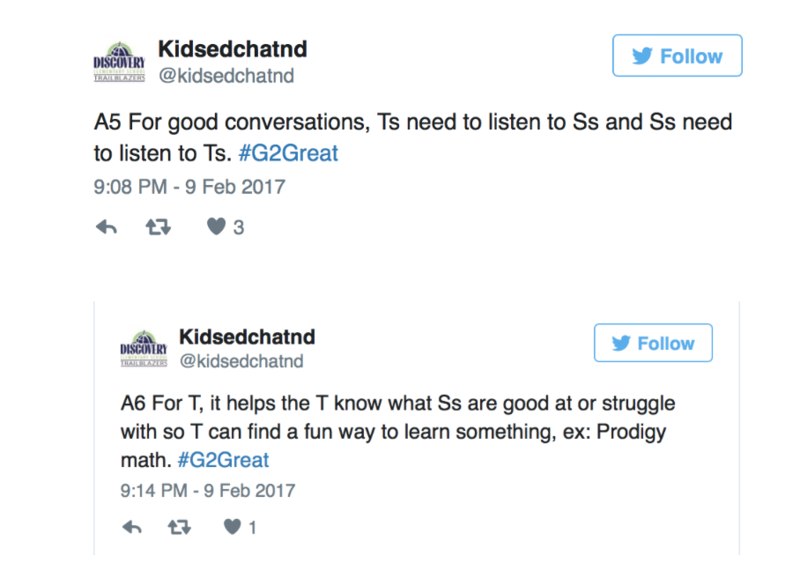 The short and long term planning that goes into moderating a Twitter chat involve skills that many adults work towards improving, yet these girls – they are doing it! 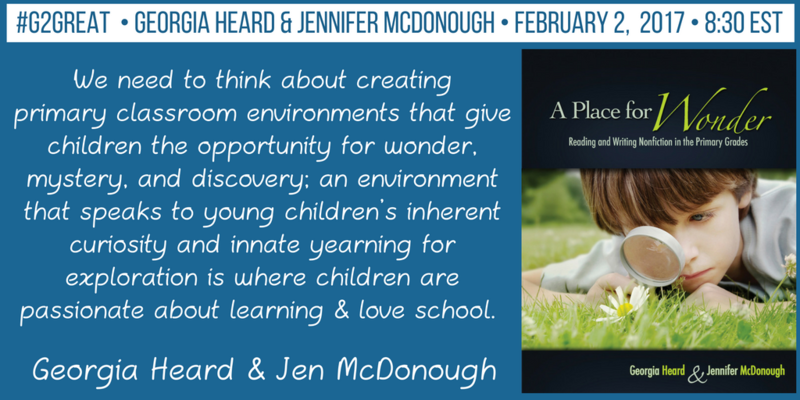 Eden and Ella are driven and they thrive when working behind- the-scenes because they have seen the success that comes from creating a space for kids to share ideas and learn. You can see their energy and passion in the tweets below! In order to learn, a learner needs to experience something. Passive learning just does not stick for most learners. It could be a shared experience in the class that is set up or some real world scenarios where students experience something and collaborate and problem solve to figure it out. 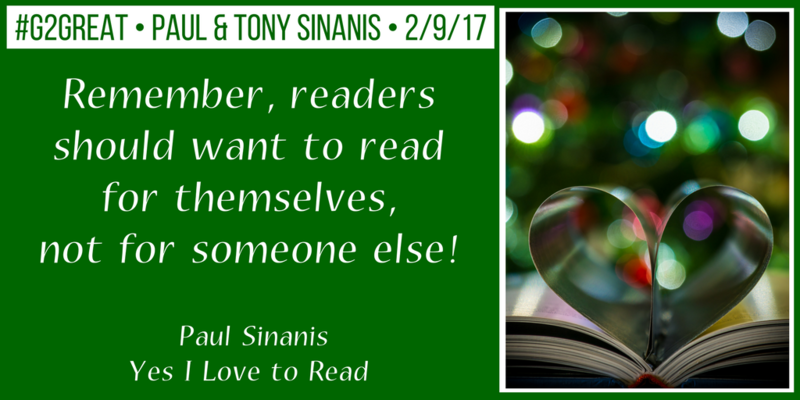 Writing for an authentic audience with real world purpose is another way to create an experience for learner. Learners need context and this is a great way to begin to move across progressions in learning. 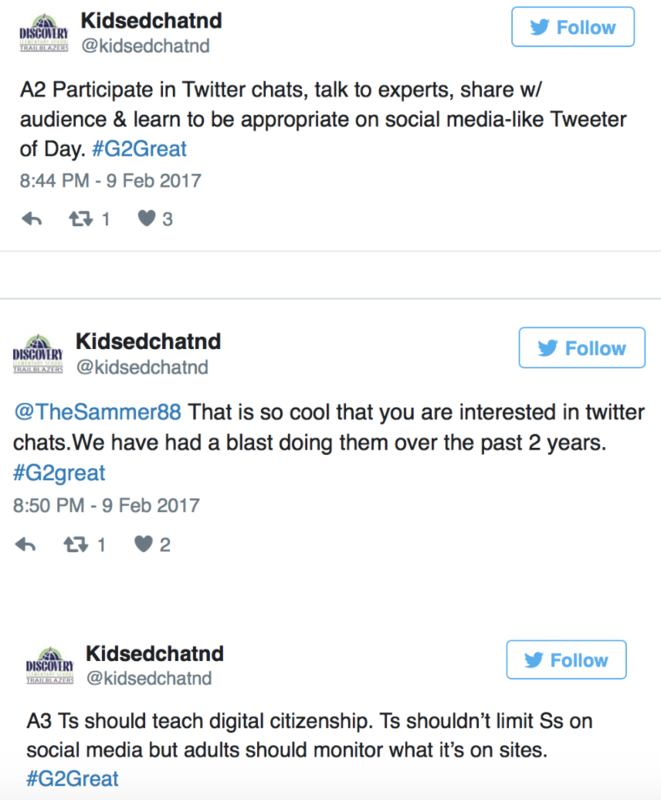 As educators, we have a responsibility to teach students how to use digital platforms and social media responsibly. We can no longer make excuses and avoid social media, it is embedded throughout our lives and especially prominent in the lives of kids. If we do not teach students how to become responsible digital citizens and how to use social media they will likely learn it from somewhere else and they may not have opportunities to learn how to be responsible in using social media. Students need appropriate role models to learn from as it relates to the digital world. 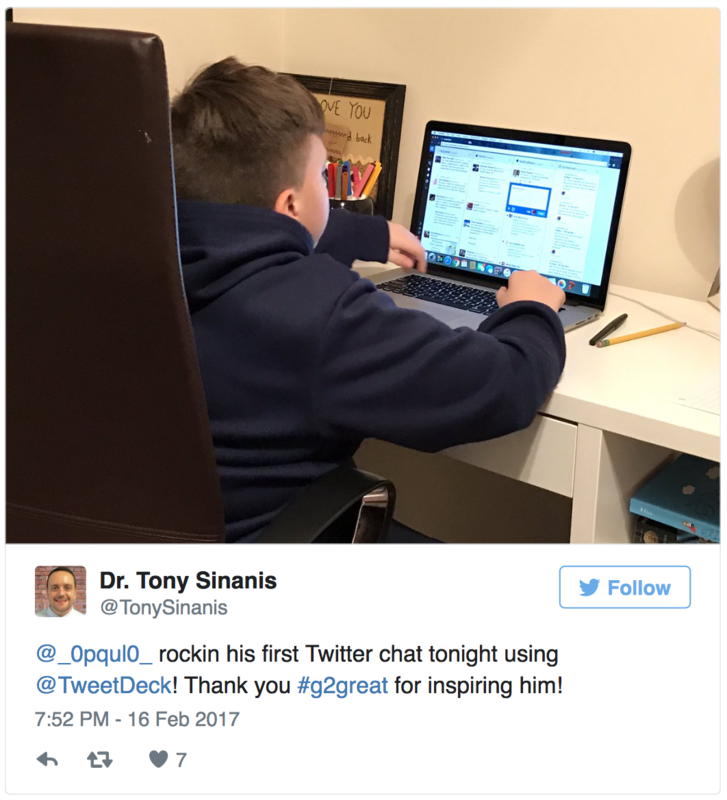 Teachers have opportunities to teach students how to write and share their ideas using social media with an authentic audience in the real world. When teachers and students share ideas they each bring their own perspective to the discussion. This reciprocal sharing of ideas through discourse provides opportunities for students to learn a very important skill for the real world. Students learn how not only speak and articulate their ideas, but also how to listen to other voices, particularly when they might be different. 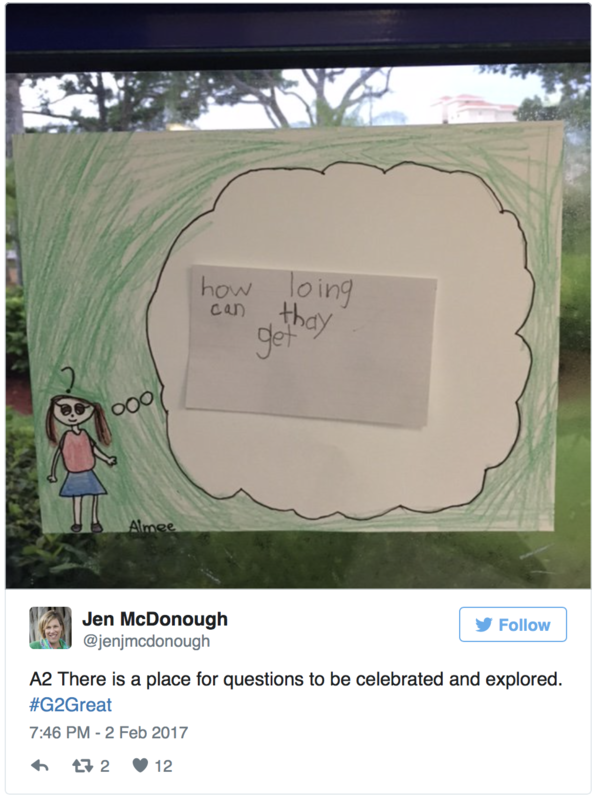 The potential for learning when students and teachers engage in this sort of idea generating discourse is something we should want for all students. 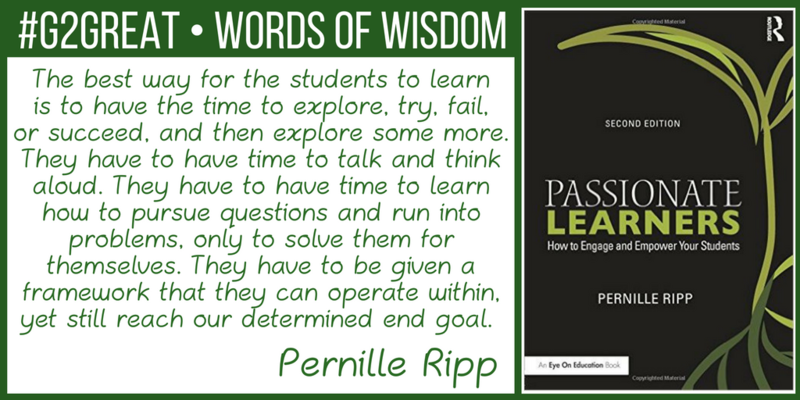 This provides that students engage and learn to develop complex ideas while they speak, listen, read and write. 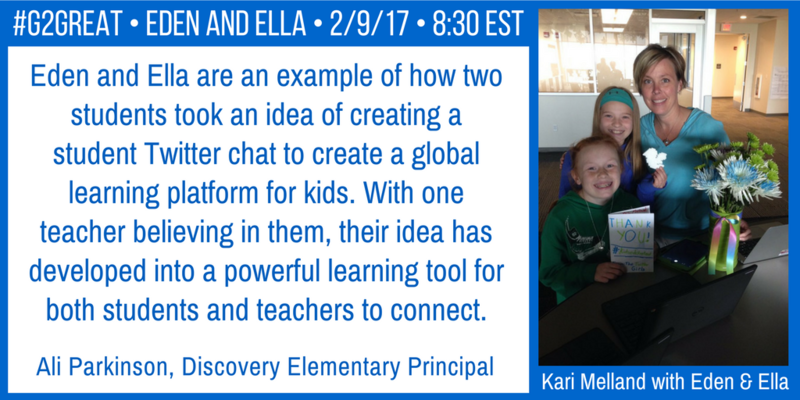 Eden and Ella showed us real-world opportunities that explore a new dimension in the Twitterverse that we have really not explored before. 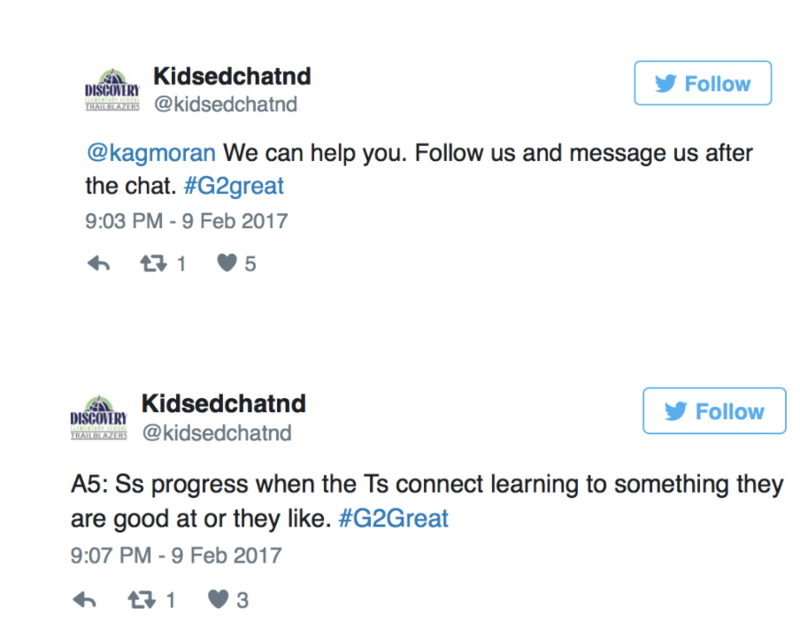 We have had students on the #G2Great chat, however creating a shared Twitterchat on February 9th provided us with a lens to see how Eden and Ella have engaged in their own chat and created a platform for students to share their ideas. We learned from Eden and Ella about how planning, experience, responsibility, and perspective all impact student learning in some way. 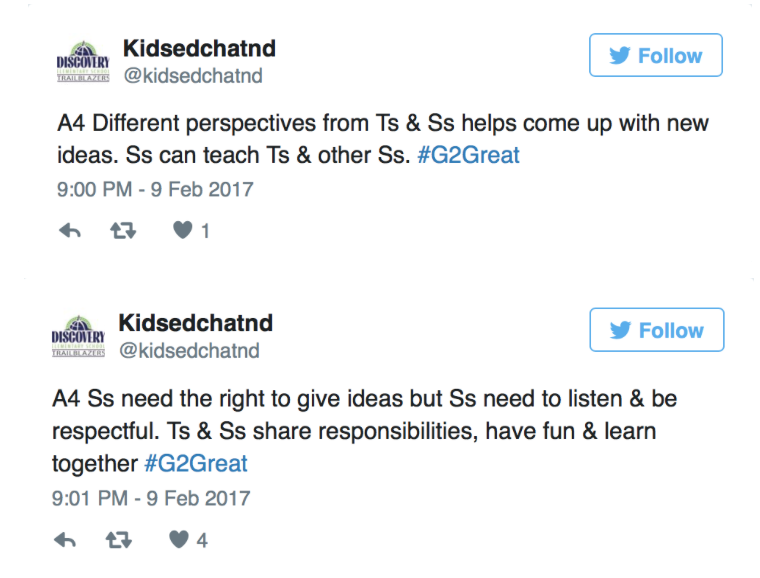 Through the tweets, but also through their process in creating and moderating #Kidschatnd we learned that these four ideas impact student learning and their twitter chat is a model for how students learn. 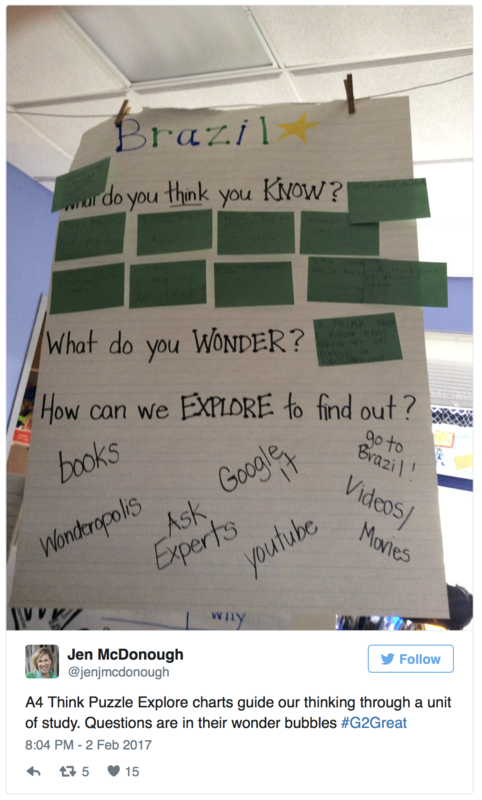 Plan: We learned that a plan for learning is important. 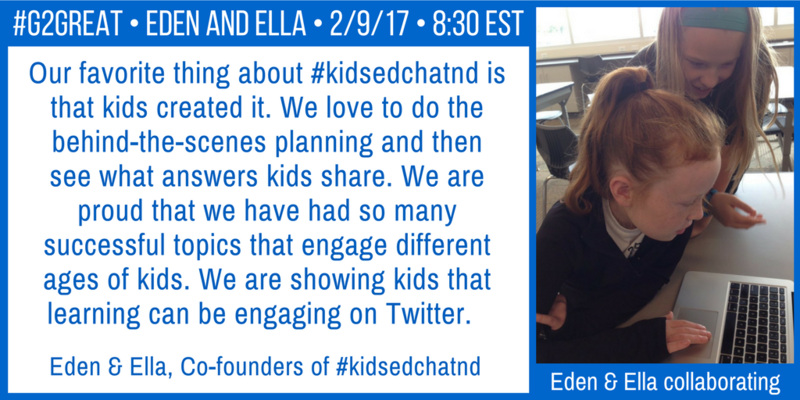 Eden and Ella plan and complete the behind the scenes work to get their ideas to #Kidsedchatnd. Experience: We learned that it is important that as students are learning that they are engaged in an experience that helps to create a context for the learning. Eden and Ella are creating an experience through the planning and the chat time that enhances their learning. Responsibility: We learned that when learners take responsibility for their learning amazing things (#Kidsedchatnd) can happen! Eden and Ella are a model of students taking responsibility for their learning. Perspective: We learned that it is important for students and teachers to share ideas because when we share ideas, especially with people who have a different perspective, our ideas only get better! Eden and Ella showed us that when kids and adults get together to talk serious about learning, the kids are teaching us! 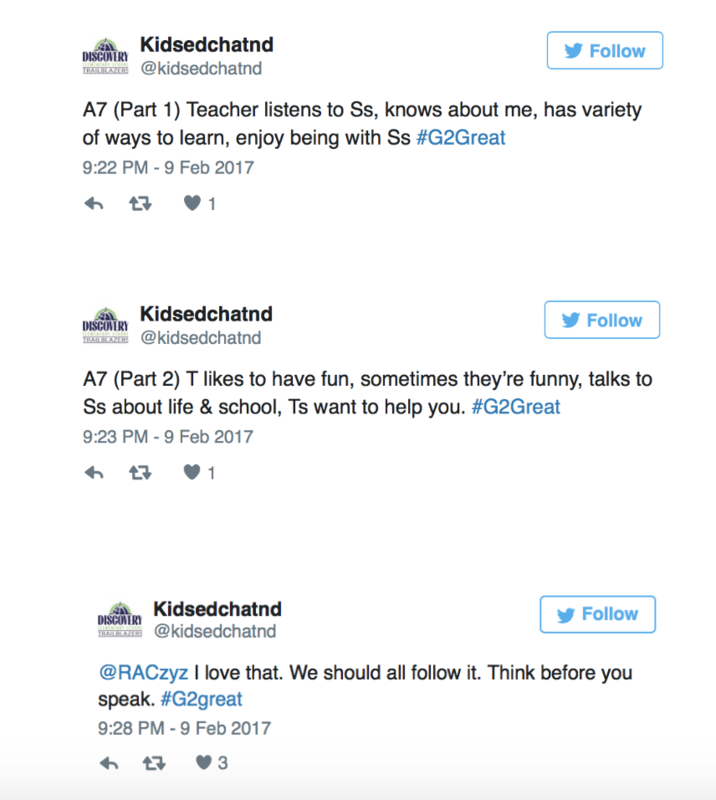 #G2Great is grateful for the collaboration with Eden and Ella as well as their parents, teachers, and principal. We look forward to future collaborations and know that Eden and Ella will be in our minds, with each and every decision we make, because students have to remain at the center. We will continue to invite Eden and Ella and all students to stand beside us, learn beside and become a collective force in the learning landscape of education.